Ashley David Joseph Heenan was the first President of the World Croquet Federation and a leading figure in New Zealand croquet for over 40 years. Born in 1925, Ashley was schooled in Wellington and attended Victoria University, prior to two years’ study at the Royal College of Music in London. He had joined the New Zealand Broadcasting Service at the age of 17 and returned there in 1951 working with touring overseas artists for the NZBS Concert Section. He worked as Music Assistant to two conductors of the National Orchestra, later becoming the first Musical Director of the Orchestral Trainees, a job he retained for over 20 years. This group was renamed Schola Musica – and many an experienced orchestral player emerged from its ranks. During a busy administrative life, Ashley Heenan was able to sustain his own urge to compose. Much of his early output was film music, frequently with an indigenous flavour. Most would agree that his musical score for Baxter’s Jack Winter’s Dream was his most significant. But it was part of a large list of compositions. Ashley lived almost his entire life in Wellington, but his influence radiated widely. He conducted the NZ National Youth Orchestra on a tour of Britain and the Far East; for more than a decade he headed the NZ Composers’ Foundation; he was New Zealand’s first Writer-Director of the Australasian Performing Rights Association; and, shortly before his death, he saw the publication of God Defend New Zealand: a history of the national anthem. This acclaimed and highly readable work was, perhaps surprisingly, the first substantial account of the history of the country’s national anthem to appear in the 125 years since its composition. His services to music were recognised with honours from the NZ Phonographic Industry, as well as the Citation for Outstanding Services from the NZ Composers’ Association and the granting of an OBE in 1983 from the Queen. He collected first editions of Tchaikovsky and Bernard Shaw, and was a qualified pilot and rugby referee. As for croquet, Ashley Heenan’s career lasted over 44 years. He won his first title – the New Zealand National Tournament – in 1945. As a young boy, he attracted wide publicity to croquet at a time when youth in the sport was quite unique. His victory in the NZ Opens of 1946 was featured with a full front page photo on the Wellington Sports Post. He regained the Open Championship title in 1948, 58, 59 and 64, a record only excelled by Arthur Ross, and not exceeded until 1977 by his own pupil John Prince. In 1958 he had the rare distinction of winning in all four events of the NZ Championships for which he was eligible. In 1959 he was again finalist in all four events, and won three. 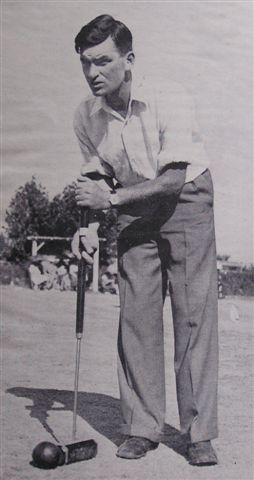 His lifelong relationship with Arthur Ross (also his father-in-law) had tremendous influence on the direction followed by croquet between 1945 and 1964. Between them, they engineered the tactics that won the 1950 MacRobertson Shield for New Zealand. However, after that his international career was somewhat restricted by the demands of music, and he was unavailable for the tour of England in 1956. His standing as a player was such that Maurice Reckitt recorded in the Gazette his opinion that his unavailability was the difference between NZ winning or losing the MacRobertson Shield. During this period, Ashley published his own highly successful magazine, The Croquet World, and was invited by the NZCC to be editor of the flagging New Zealand Croquet Gazette, then on the verge of demise. He was editor from 1957 to 1961, when he became NZ Referee, a position he also filled with distinction. In 1957, he was appointed to a constitutional revision committee of the NZCC that made several innovative recommendations that were consequently adopted. In 1960, as chairman of the NZ Laws Re-draft Committee, he spent a week in Sydney with Ian Baillieu, working on the finalised draft of the proposed new laws. Baillieu later acknowledged the part Ashley played in resolving the seemingly insuperable differences between the Croquet Association and NZCC to produce the laws that remained substantially in effect for the next 40 years. In 1963 he was appointed Captain of the NZ MacRobertson team, but was forced to withdraw when awarded a UNESCO travelling Fellowship. On returning from his tour, he played in the 1964 Championships, winning the Open, and with his protégé John Prince the Doubles Championship. The demands of music saw him withdraw from the national scene, and until 1979 his croquet was limited to local club and association events. Following the death of Arthur Ross, and with some persuasive encouragement from John Prince, he once again began competing in national tournaments. In 1979 he embarked on what virtually became a second career in croquet. In that year he was elected editor of the NZ Croquet Gazette for a second five year term. In 1984 he became a North Island Vice President, and in 1985 he was appointed to the role of President. He retired from this office before completing his term, feeling that the incoming President should have a year in office before the 1990 MacRobertson Tour, and that the new constitution should come into effect with a fresh hand on the helm. During his period of office he saw reform of handicapping, laws and the constitution of the NZCC. He established relations with the Assembly of Sport, the Hilary Commission, and new ventures into international sport. His interests in International Croquet contributed to closer relations with Australia, England and the USA. In 1986 he managed the NZ MacRobertson visit to England, where the team accorded him the honour of playing in the last test. It was on this visit that the proposed World Croquet Federation project was initiated. In July 1989 he was unanimously elected the first President of the newly formed WCF, the nomination appropriately being put forward by his life-long and close friend, John Solomon. The measure of his wide interest in the game can in part be found in the list of trophies he has presented the NZCC through the years. He also designed the NZ Champion Pocket and Medal. During the 1950s and 60s he spent much time touring the country often in company with Arthur Ross and later the young players John Prince and Tony Stephens playing exhibition games, giving demonstrations and coaching lessons. As with music, he brought to New Zealand and to world croquet a sense of purpose that it sorely needed. At the time of his death he was survived by his wife Maureen, two sons and two daughters.